Biolubri bio-based lubricants offer users a wide range of environmentally friendly lubrication solutions that are developed to meet environmental requirements. These revolutionary green products provide users an excellent alternative to mineral based lubricants without comprising on the lubricant’s performance and capabilities. 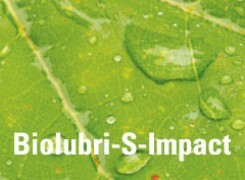 Biolubri’s lubricants are both rapidly biodegradable and non-toxic to the applicants and environment. Ideal for use in situations where demand for environmental protection is a matter of priority. While in use the lubricants offer optimal performance, ensuring the smooth running of the equipment. However if any Biolubri enters the environment it will fully biodegrade without leaving behind any residue - no oil sheen, no scum, no poisonous chemicals. • Biobased Lubricant: Meets stringent environmental requirements. 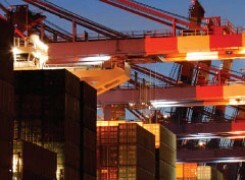 • RoHS Compliant: Meets European Union Restriction of Hazardous Substances Directive. • Does not contain heavy metals. • Can usually be applied even when wire ropes are wet. • Excellent Hydrophobic properties: Does not leave a sheen on the surface of water. • Non-Drying Film: Protective layer prevents penetration of moisture and retains flexibility without cracking. • Fortified with Rust Inhibitors providing chemically active protection against corrosion. • Excellent Adhesion Properties: Ensures excellent adhesion to wire ropes even during the most demanding of operating environments. • Suitable for all climatic conditions: It provides excellent lubrication as well as rust protection in all weather conditions; tropical or arctic. Biolubri S-Impact is a multi-purpose grease fortified with special additives enabling it to withstand the heavy impact and pounding pressures common to heavy equipment. Our special additive package allows the grease to stay in place and not to spatter or pound out of the bearing or fitting. Most greases manufactured today do not have this anti-spatter capability. BIOLUBRI-S-GUARD is an all purpose non-melt grease specially formulated with extreme pressure and anti-wear additives to provide heavy duty service. It is one of very few greases able to withstand heavy shock load and impact pressures of 50 Timken load capabilities. Biobased Silicone, Food Grade Grease. 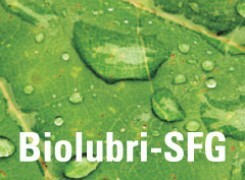 BIOLUBRI-SFG is a pure silicone based food grade lubricant that has excellent water resistance to prevent washout and insure mechanical stability under working conditions. This product has rust and corrosion inhibitors included in the formulation. Other features include excellent shear stability, excellent low temperature pump ability, colourless, and buttery texture. Biobased Wirerope Lubricant. 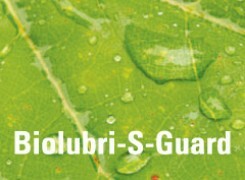 Biolubri WRL is an outstanding, multi-purpose wire lubricant, with proprietary E.P. agent to enhance the load carrying capabilities of the lubricant. Biolubri WRL is blended with a high quality white oil and processed bitumen. It is fortified with additives for extreme pressures, anti-wear, anti-oxidation, anti-rust, and corrosion inhibition. 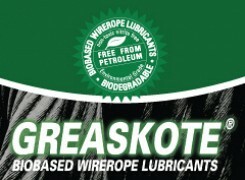 Biolubri® Greaskote-C is a bio-based, environmentally-friendly wire rope lubricant with excellent lubrication and anti-corrosion properties. Specially developed for wire rope manufacturers, it is an anti-corrosive grease that provides ultimate rust inhibition and long-life lubrication for wire ropes and marine conditions. 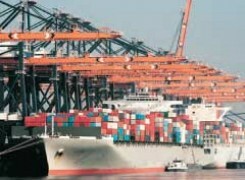 Biolubri® Greaskote 100-LG is an environmentally safe, penetrating-type wire rope lubricant. It has strong affinity properties for metal, making it a good choice for use in waterways as the lubricant will cling to the wire rope. Environmentally Friendly Wire Rope Conditioner Grease. Biolubri® Greaskote 100 is a wire rope conditioner & lubricant that exhibits excellent lubrication and anti-corrosion properties. 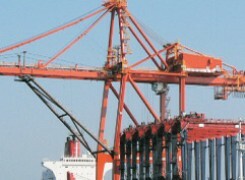 It is specially developed for the marine environment, providing ultimate rust protection and lubrication for wire ropes.